The Wood EZ Sander was developed to fit the needs of both the small cabinet & furniture builders as well as the advanced wood worker looking for an affordable way to move up to a wide belt sander. The EZ Sander allows shops to finally upgrade from hand sanding or their drum sander and yet still keep the unit small enough and portable to fit their shop. The EZ Sander is loaded with features and built with in a heavy duty construction to provide for years of dependable, consistent, labor saving sanding. 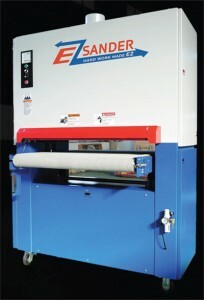 The EZ Sander is built to process parts up to 36” wide with the ability to hold very tight tolerance side to side. 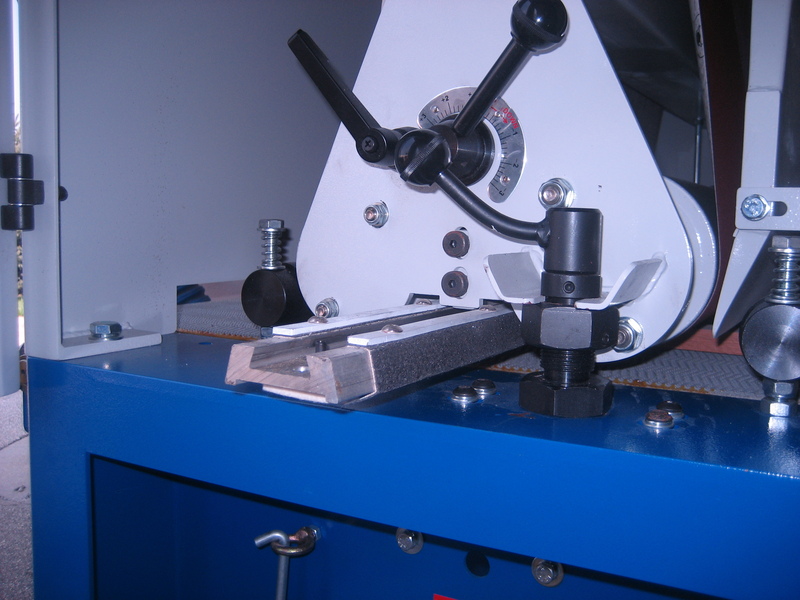 The sanding head is a combination head which consists of a 5” rubber covered contact drum for being aggressive followed by an adjustable 2-1/2” graphite covered felt polishing platen for doing very fine finishing sanding. The EZ Sander is equipped with a removable 2-1/2” platen for easy maintenance and upkeep of the polishing platen to ensure you the best results when going for the very fine finish for your parts. 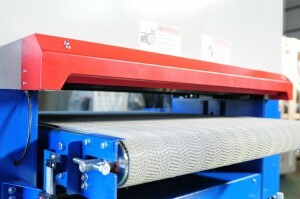 The conveyor belt speed is set to run at 10-30 fpm and is controlled at the main control panel by simply turning the dial to your desired speed within the 10-30 fpm range. 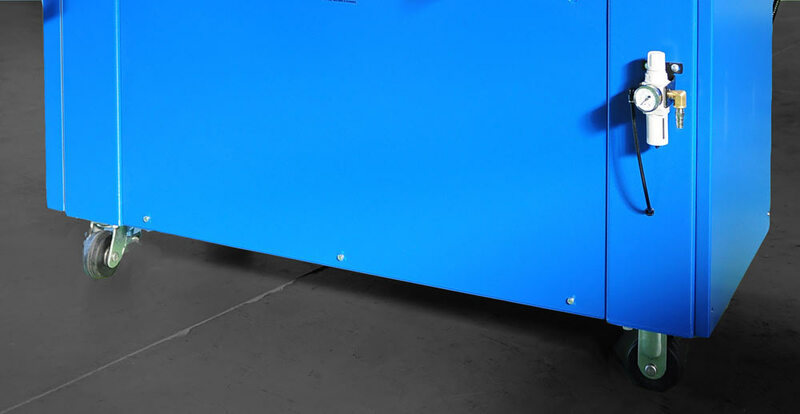 The conveyor table/bed opening has a 0” to 5” opening allowing the operator to sand some parts as thick as 5” and have the ability to sand very thin parts as well. The Wood EZ Sander comes standard with a set of heavy duty casters to allow the operator to move the sander to the desired place for operation when needed or roll out of the way when not being used. The EZ Sander is equipped with a state of the art electronic tracking system for the abrasive belt. With an electronic beam of light and a pneumatic cylinder working together in an enclosed system the abrasive belt is tracked automatically to allow you to prevent possible streaking caused by uneven mineral wear on the abrasive belt. 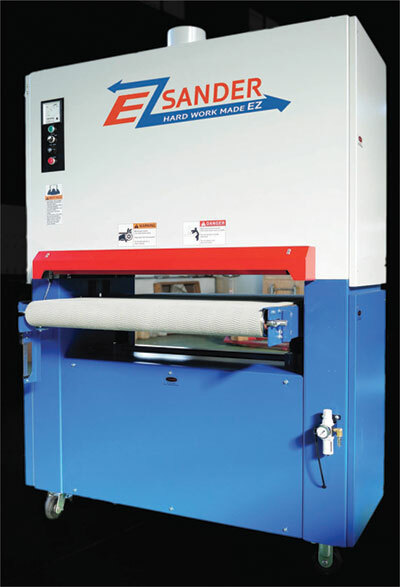 The EZ Sander has been built with several safety features with one being the interlock on the abrasive belt loading door which prevents the operator from continuing to run the abrasive belt motor when the abrasive belt loading door is open while it is running. 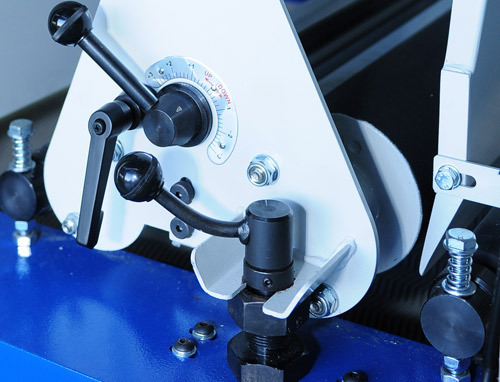 If the door is opened while the machine is running the machine automatically shuts down the machine and the disc brake on the main motor is engaged to stop the belt in a few seconds. 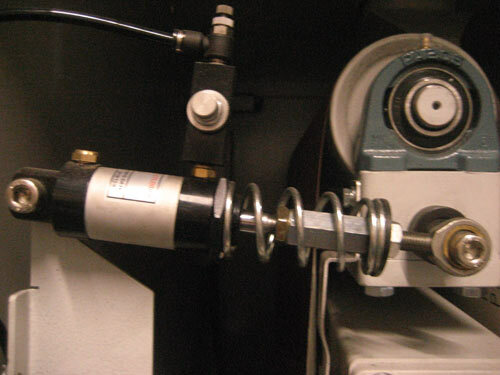 A digital readout thickness gauge is provided to make setting the height or the conveyor bed to the desired thickness with readout being down to the .001” or .01mm. 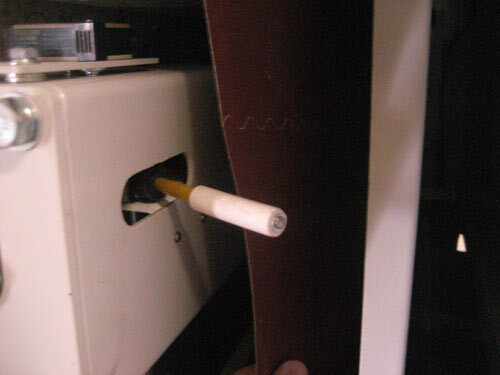 Centrally located control panel lets the operator easily reach and view the necessary items from the front of the machine while loading parts at the infeed area of the machine. 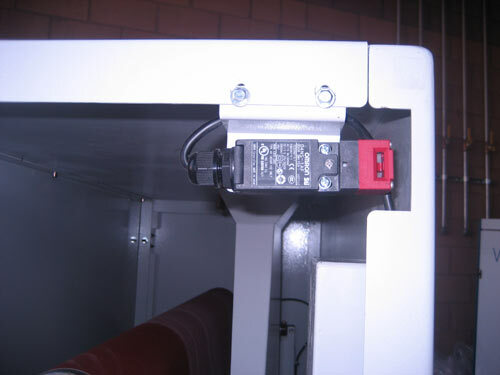 Overthick safety door at located at the infeed area of the machine is designed to help prevent the feeding of overthick parts from being feed into the machine which will help keep the machine and operator from being harmed or injured. 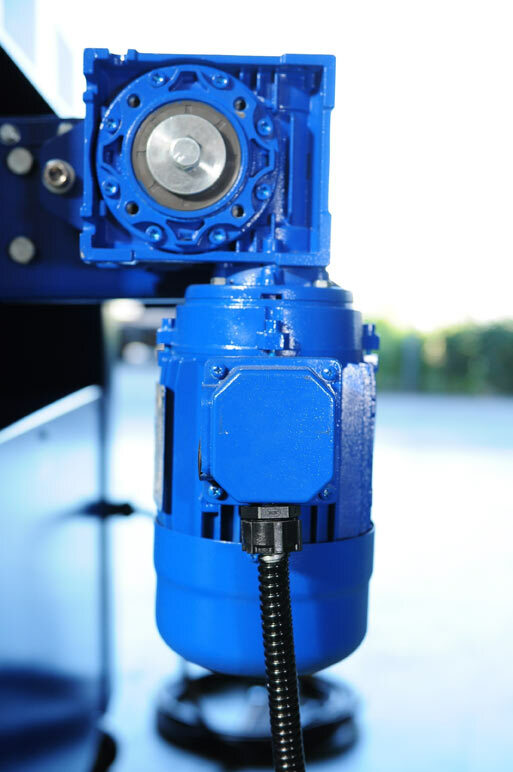 If too thick of a part is fed into the machine and triggers the door safety switch, the machine is designed to shut down helping to prevent any harm or damage to the operator and or the machine. Safety Micro Switches are positioned on both inboard and outboard sides of the abrasive belt to keep the belt from tracking too far. 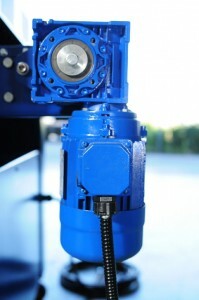 These limit switches have ceramic sleeves on them to help prevent any spark if the abrasive belt should track too far and engage these micro limit switches. The EZ Sander was developed to fit the needs of both the small cabinet & furniture builders as well as the advanced wood worker looking for an affordable way to move up to a wide belt sander. The EZ Sander allows shops to finally upgrade from hand sanding or their drum sander and yet still keep the unit small enough and portable to fit their shop. The EZ Sander is loaded with features and built with in a heavy duty construction to provide for years of dependable, consistant, labor saving sanding.